People born specifically on the 3rd of February are believed to be curious, open minded and friendly with the typical Aquarian strong independent streak. This particular day's ruling astrological planet is Jupiter creating personalities with an extra touch of charm and mental alertness. If you have this birthday you also acquire an excellent sense of timing and can be more versatile and flexible in your views than most water bearers. You are a quick learner with a talent for coming up with new good ideas that are conventional yet eccentrically futuristic. Although you are a little shy you are still rather sociable and enjoy communicating and working with others. Individual's with a February the third birthday can be especially adept at getting others to talk about their feelings without disclosing their own. Your magnetism is coupled with a high degree of compassion and this and your enthusiastic forward looking outlook make you well liked and inspirational to some. Work to a person born on the third of February is an area of life where you feel you may be able to make a difference. You will generally seek a job that will enable you to have the power to assist others to improve their lives. You will usually desire a working life that has a meaningful purpose that you gain satisfaction from. With your finances you are sensibly frugal and do not often have much difficulty managing your budget effectively. You find it hard but not impossible to save if it for something you really want. Despite this you tend to dislike, and so avoid, borrowing if you possibly can. For a Aquarian, the person born on the third day of February is untypical in their approach to love and intimacy. Even though you are still cautious and more tuned into your body and mind rather than your emotions, you strongly crave the closeness found in soul mate relationships. You are likely to believe that friendship and a mutual devoted understanding are the most important elements of a long term personal relationship. Your modicum of shyness is often totally forgotten about when you are attracted to someone you like and you are not afraid to tell them how you feel. An ideal partner must be stimulating both intellectually and physically otherwise you could get bored fairly quickly. They also need to be able to give you space occasionally and be able to help you see the humorous side to life when you are disappointed or upset. When it comes to health any problems experienced by those born on February 3rd are usually associated with your love of food. You generally have the attitude that you can eat whatever you want and are not keen on exercise so weight gain issues can sometimes surface. People born on this day are ordinarily a bit absent minded regarding medical and dental appointments. Your joints, bones and teeth are weak spots in your constitution so you may need to watch these areas carefully. Avoiding constant strain on these specific parts of the body and cutting down on sugar intake should lessen the possibility of complications. Your main strength of character is in your methodical attention to detail that is present in everything you do. You are inclined to be a bit of a perfectionist and always aim to complete things to the best of your ability. Personality weaknesses that you should recognize are your tendencies to every now and then be self indulgent or untypically unreliable. These negative characteristics could frequently put in an appearance when you are feeling out of sorts or unusually drained. If you try to avoid wearing yourself by looking after yourself properly out these unfavorable traits will be rarely seen. Being born on the 3rd of February grants you lots of unselfish ambition and more than enough enthusiasm for the setting of personalized goals. You aspire to benefit others with your intelligent versatility and may dream of achieving something significant to help those less fortunate. For yourself you mainly seem to wish for a special person to share the up's and down's of life with. The desire for children is another of your dreams. Your hopes for the future can also include wanting to further your knowledge about the world and maybe visiting some unusual places to discover cultural differences. As you were born on the third day of the month your birth date has a Root number of Three with the keyword 'Innovation'. 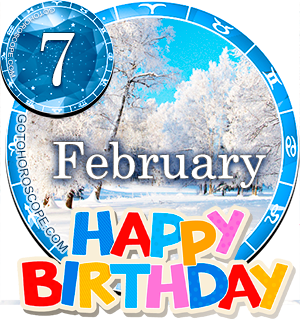 This numerical reference to your birthday highlights your high adaptability and attentiveness. The 3rd Tarot card in the Major Arcana, the Empress, is the one most associated with your date of birth. This emphasizes your aspirations to utilize your intelligence for the good of others. The lucky gemstone allocated especially to February the third birthdays is the Amethyst. Wearing it close is thought to intensify intuition and concentration as well as generate luckiness. Aquarian personalities are assumed to be astrologically influenced by the cosmic forces of the planet Uranus. The actual day you were born, the third of February, is governed by the celestial body Jupiter making you not quite as self reliant as the majority of your zodiac sign. Your alert and analytical mind are your finest attributes and they help you make good decisions and judgments throughout your life. The only thing that could prevent you progressing is the proneness to not take keeping healthy seriously. This neglect is inconsistent	with your level of intellect so if you can conquer it there should be nothing to stand in the way to success. A concluding thought for people born on February the third is to have confidence in your abilities and trust your instincts. Some of it was correct, but generic, as most horoscopes are...I've had better Tarot Card readings. "The desire for children is another of your dreams." I have a crush on a lady who is a Aquarius; and my Mom is also an Aquarius and she is so nice to me. I am really hoping the stars and universe bring me and my crush together soon. My God! This is so "on point" it's disconcerting. Yesss..... this is so close to me. and i think while i was reading all this stuff i was feeling that she is in front of me. Agreed, this is very accurate! Do any of you feb 3rd fellows have difficulties with concentration because your mind is always thinking?! Yup...my mind can't stay focused on something i do,i keep on thinking. So mostly i end up doing multiple work. 85% accuracy, really quite surprised and really enjoyed reading about me! !